Every summer I spend a few days in Vermont while my older son is at music camp. Sometimes I stay with friends, but this year I stayed at the very historic Rowell's Inn in the very tiny town of Simonsville. Rowell's was a safe house on the Underground Railroad in the 19th century, and one of the third-floor guest rooms opens onto the attic where the owners hid runaway slaves. The inn was also featured on the Ideal Tour, a three-week trip around scenic New England, early in the 20th century. Hanging in each room are century-old pages from the inn's guest books, complete with the number of horses and servants guests brought with them. Inns like Rowell's take you back in time. You can't mind a little dust - there's just no way to get a historic, relic-filled place like Rowell's really clean. But the overwhelming presence of the past makes up for the dust bunnies and cobwebs. Sadly, Mike, the owner of Rowell's, told me he's just about ready to hang it up. The recession slowed Vermont tourism for a few years, and then Hurricane Irene took it out completely in 2011. I hope whoever ends up with Rowell's finds a way to keep its history alive. Mike hails from San Francisco and turns out solid Cal-Mex food, an uncommon treat in the Green Mountains. He served me a breakfast quesadilla like this in the Rowell's Inn dining room, the same room where elegant ladies in bustles and big hats no doubt took their tea and crumpets a century ago. About smoked salt: Buy some and put it on everything. 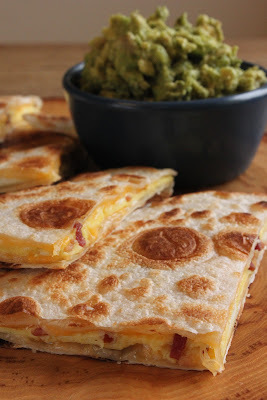 A thin omelet studded with cooked bacon and sandwiched between flour tortillas with melted cheese. The smoked salt adds an unusual note to simple guacamole. Make the smoked salt guacamole: Cut the avocado in half, remove the pit, and scoop the flesh into a small bowl. Cut the lime in half and squeeze the juice from both halves over the avocado. Mash with the tines of a fork until you get the consistency you want. Season with the smoked salt. Set aside.Make the omelettes: Heat a 10-inch nonstick skillet over medium-high heat. Crack the eggs into a bowl and whip them with a fork. Spray the skillet with cooking spray and pour in half the beaten eggs, then sprinkle over half the bacon (you're making very thin omelets, which will go inside the quesadillas). When the eggs are set, flip the omelet with a spatula. Slide it onto a plate when it's cooked, then repeat with the other half of the beaten eggs and bacon. 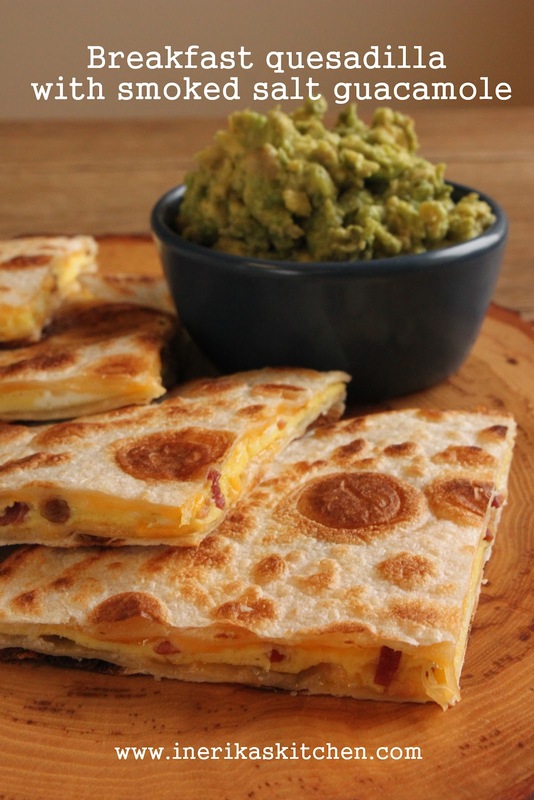 Keep the skillet on the heat.Assemble the quesadillas: Lay two tortillas on the counter or a cutting board. Sprinkle each with 1/8 cup grated cheese, then lay an omelet on top. Sprinkle each with the rest of the grated cheese, then put the remaining tortillas on top. Lift one quesadilla into the skillet and grill it until both sides are golden brown and the cheese inside is melted and gooey. Repeat with the second quesadilla. Cut the quesadillas into quarters and serve with the smoked salt guacamole.